Would you put butter in your coffee? In a quest to find the perfect form of dairy substitute to add to my morning coffee, I kept coming up blank. Cream seemed obvious (and so delicious), but not if you have trouble digesting lactose. 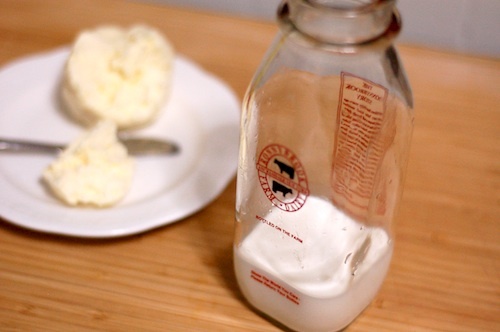 Non dairy substitutes have too many harsh additives and just don’t taste the same. The only option left was butter. Yes, butter. But… how? Coincidentally, as my mind was skipping through clouds of buttered coffee fantasies, I get a text from my dear friend Jessica, “What about butter in your coffee?” Great minds think alike. Genius! Apparently this is not uncommon and thought to have added health benefits. Who knew? Let me know if you would be willing to try it, or if you have already, what’d you think? I made unsalted butter, but you can add salt or whatever flavoring (herbs, honey…etc) you like into the recipe. Turn mixer on high-speed and whip cream for about ten minutes. It will harden and then just when you think you’ve got butter, keep mixing. The water will slowly separate from the butter. Drain the water and whip some more. Drain again, repeat. Once the consistency is semi solid drain and transfer into a bowl of ice water. Let sit for about five minutes and refrigerate until consumption. Brew two cups of coffee (you can try this brand, Bulletproof Coffee) or in my case I used 6 cups of stove top Cafe Bustelo Espresso. Place in a blender with butter, coconut oil, vanilla, and honey. 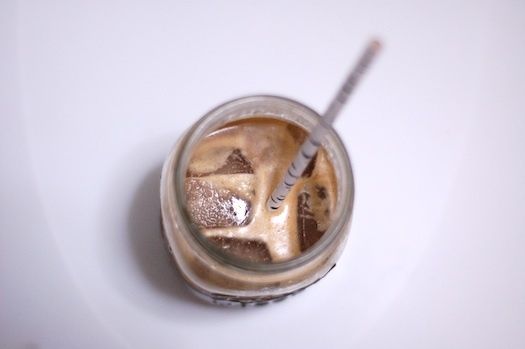 For iced coffee, place in a jar, add ice and shake rigorously, or throw in the fridge for the next morning. *Update- you can make this without a blender, just add butter and coconut oil when coffee is hot and whisk vigorously. It won’t be as frothy made without a blender, but it will still be tasty. If you make the iced coffee, brew it a little stronger than usual because you will be adding ice thus it will be slightly watery. Enjoy! P.S. 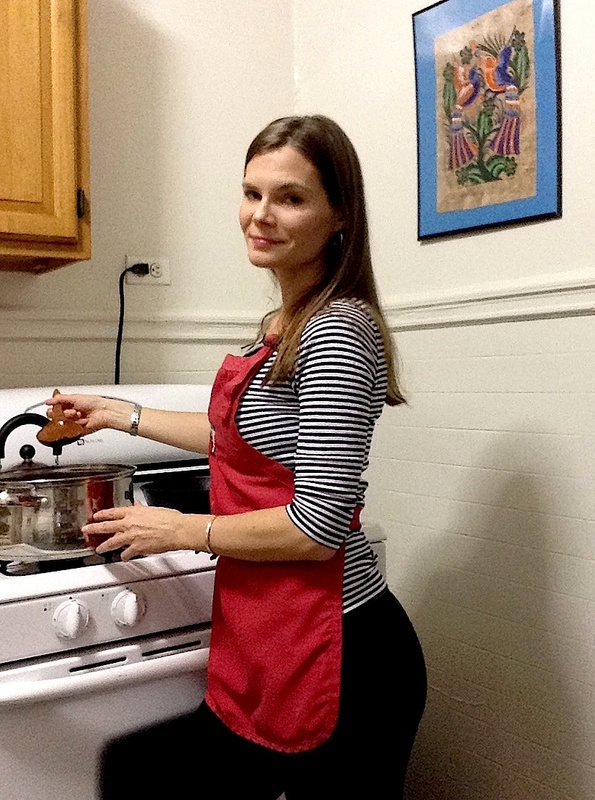 If you liked it here, check out my seasonal Pumpkin Spice Buttered Coffee recipe. Easy to make, no pumpkin required. Huzzah! There you have it! 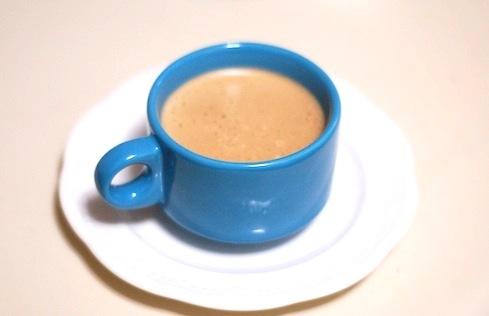 A hot or cold creamy homemade coffee. 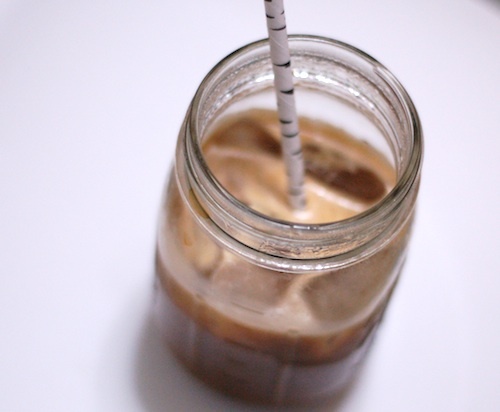 Drink on the spot or refrigerate for tomorrow morning’s iced coffee! *Inspired by my awesome friend Jessica and the Bulletproof Exec. ← This intro is a Little Wilted: Crispy Kale Chips. I just made this (without the sugar). Very satisfying and delicious…plus it’s like liquid chapstick for your lips. Win and Win. Ha! That’s great! Thanks Jessica. It tastes pretty good too! I just made this (without the sugar). Very satisfying and delicious…plus it’s like liquid Chapstick for your lips. Win and Win! Ha! I’m not a baker so pardon my confusion, but if you want to avoid the lactose in cream, how does starting with cream and making butter do that? It seems to me you’re still using cream, which contains lactose. ? Thanks for your comment Steph. Excellent question! 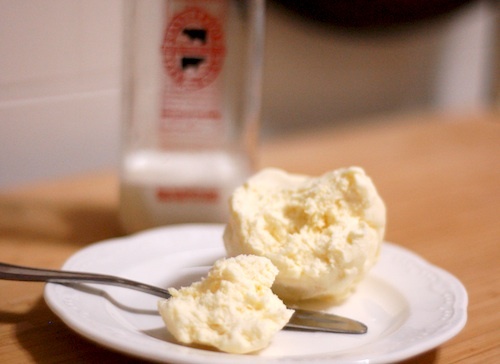 In draining the excess water in the cream (when you make the butter), it also rids some of the lactose. The lactose is generally stored in the water. Butter has less water and the fat is more concentrated than cream thus resulting in less lactose. Hope that helps! Are you going to try the recipe? If so, do tell how you like it! While I have successfully moved off cream and sugar and love my coffee black, I find coffee concoctions to be very interesting. And now we have butter in coffee. Huh. Similar to my Harry Potter Butterbeer research, this seemingly super unhealthy but potentially tasty coffee is apparently a traditional drink in some places around the world. This may need more investigation in the future.